thank you all for taking a gander of my shop. i got real nervous last night that no one was going to like the things i made...i got sick to my stomach, and then i thought "well if they don't like it then at least i have some new stuff for MY house." and then i didn't feel like i wanted to throw up anymore. i think my kids have been wiping their boogers on the couches. they've been getting away with a lot these past two days. so i'm off to register a kid for kindergarten. i'm going to sweep up my house of strings, pieces of cut up fabric, and dirt from kids running in and out, in and out, in and out. and then i'm going to take a shower. and then tomorrow, i think i'll clean, and scrape up some of the boogers off my couch. Love it all! Some serious booger scraping needs to be going on here in Texas too. But I just can't seem to get motivated to wash the floors and put away the clothes. Too much other stuff to do. Whew!! It is nice to know I am not the only one that can let things go when I am insprired and being creative. Is that what I can smell?? oh oh oh how fun. window shopping via v's shop...sound like the perfect wishlist waiting to happen. you rock girly! can't wait to make my stitchery..:D! I am always so inspired by the things you say, the colors you use and the way you say things. Thanks so much for your blog!! The zaza pillow is super cute...I bet you'll sell it quick. I like Katie's stitchery too...my oldest munchkin is just 4 days older than your youngest. Sept. 30 was actually my due date but he came early! Good luck on etsy. What if I don't want to buy directions for the bracelet? What if I just want you to make me one of those and mail it to my house? For free. Where do I do that? Oh, yeah - love, love, love your stuff. Thanks for showing your beautiful work in your store. You have been working hard. I definitely plan on getting the little dress stitchery pattern! It is so precious! Everything is beautiful! you've had 20 something sales TODAY!!! i am SO super happy for you!!! i seriously need to make one of those bracelets, like yesterday. Vanessa, Everything is beautiful. I would worry like that, too. You're so funny!! It is hard to sew and take care of your home and family when you have a deadline you're trying to meet. I don't know how all these quilt/fabric designers get ready for Quilt Market. I can't imagine how my home would look or how I would look (or smell). 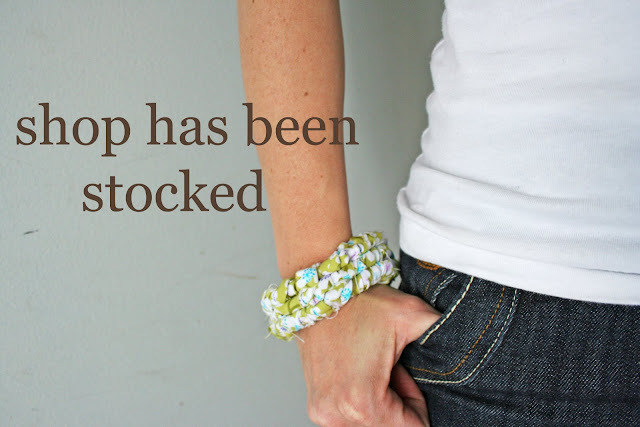 I really want a pattern for the bracelet, will you be restocking it soon? It's awesome! Have a great night! So, I had a question about the bracelet tutorial but now after reading the comments, I'm wondering if I can purchase it or if it's sold out. Anyway, I wanted to know if you needed a sewing machine to make it. I think it's so cute!